If you have an .img file on your Garmin GPS device and you want to view the same map in BaseCamp, there’s a way of loading it in without any complex conversion utilities. The map will also load in BaseCamp just as quickly as if it was installed on your machine. These instructions are for Windows and assume your .img file isn’t locked and doesn’t require authentication to view. Set the Size of Virtual Disk to be slightly larger than the .img file you want to view. For example, if your .img file is 3.5GB create a virtual disk that is 4GB in size. Select the .img file in the window that appears and click the Visible in BC button. Open BaseCamp. Wait a while and your drive should appear as a Memory Card on the left hand side listing the map inside of your .img file. At this point you should be able to view the map in BaseCamp. However, you will find that if you restart your computer, the virtual disk you created will disappear. To save you from having to repeat the steps above to recreate the virtual disk, you can create a snapshot of the disk so that you can load it quickly in the future. In this post I reference methods in the Selenium C# client driver. Equivalent methods should exist in whichever other language client driver you use. Some testing requires opening a new window, performing an action, then closing that window, perhaps even returning to the original window to continue the test. There are many, many ways of managing tabs in selenium, so lets take a look at what works and what doesn’t. First of all, Selenium really has no concept of what a tab is and how it differs from a window. Each WebDriver instance has a reference to it’s current window handler, which is points to the current tab or window that driver is interacting with. When managing tabs, we have to be able to create a window handler, switch to it, do some stuff, then switch back to our original window handler. So now you have a new tab in your browser, but you still need to tell your WebDriver to switch to it, otherwise commands will continue to be sent to the original tab. This is actually pretty easy and is done using the SwitchTo() command into which you pass the window handler that you want to switch to. This approach works when executing tests both locally and remotely. Keep in mind that you can only execute a window.close() on a tab that was initially opened using a window.open(). Not all Android libraries out there provide a Maven dependency to include it into your project. Sometimes you will just have to resort to the original method of just including the source code in your project. For this example, I will be importing the SlidingMenu library for Android by Jeremy Feinstein. To achieve this structure, you will have to create library folder in the root of your project, and import the code library you want to include into it as a module. 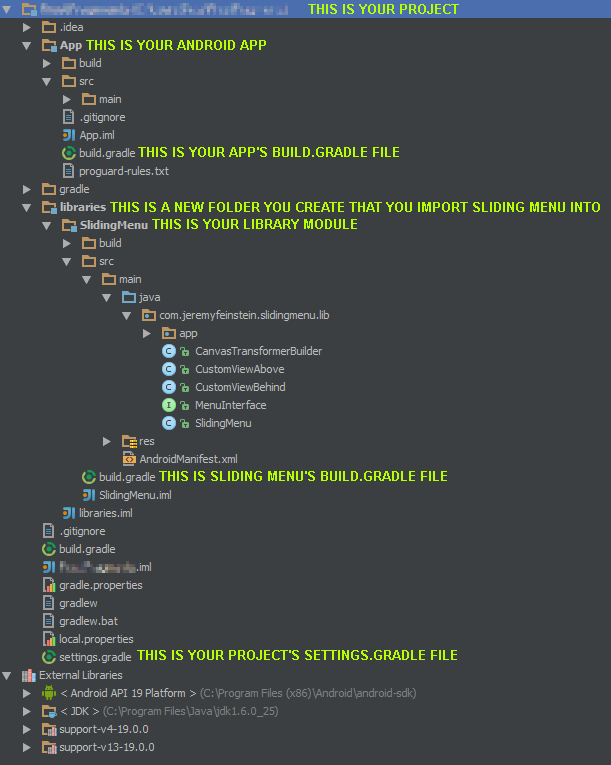 Note that if the code library you are trying to import doesn’t already have a build.gradle file, you may need to import it into Eclipse first and generate the necessary build.gradle file (as of writing this post, Android Studio is unable to generate build.gradle files for eclipse projects). This tells Gradle that your App has a dependency on SlidingMenu. This tells Gradle how to compile and build the Sliding Menu module. We’re telling it that Sliding Menu depends on the Android V4 Support library, the SDK version target to build against, and finally, the folders paths where the source code, resources, and manifest files are located. This tells Gradle the modules it should build for your entire project, and the order to do it in. Obviously we want to build Sliding Menu before we build our app, because Sliding Menu is a dependency and it expects it to be already compiled. In android studio press the Tools -> Android -> Sync Project with Gradle Files button, then rebuild your project. If all went well you should be able to import the com.jeremyfeinstein.slidingmenu.lib.SlidingMenu library into your app’s source files. There’s a new way of registering MVC global filters using AutoFac. First, remove the filter registration from your RegisterGlobalFilters because we will have Autofac handle adding them to our controllers/actions instead of MVC. A note to Android 2.2 (Froyo) users: please backup your stash prior to updating. There is a bug in your version of Android that will wipe your stash when updating the app. Please see the FAQ for instructions on how to backup Frost and this post for more details. We just released update 2.5 for Frost. As I mentioned in our previous post, we focused on the browser interface for this release. Our goal was to eliminate clutter in the options menu, and we’ve achieved this by moving a lot of common browser actions to a quick action menu in the tab bar. In future updates we will be working towards eliminating the options menu entirely as more devices are released without any hardware menu buttons. The next biggest change is the addition of tab sessions. From now on, whenever you log into your stash you will be prompted to restore the tabs from your previous private session. Note that in order for your tab session to be saved, you need to be logged into your stashes. Finally, there are countless optimizations and bug fixes. We’ve fixed some compatibility issues with some websites like Gmail and Twitter, as well as changed the way batch operations are handled to improve reliability and performance. Please don’t hesitate to contact us with feedback using the contact form at the top of the page.